The ClearSounds SW200 Alarm Clock is a dual alarm clock with multiple alerting options to best fit your needs: bed shaker, bed shaker plus sound, flashing lights plus sound, or shaker plus flash. The tone is adjustable in volume up to 87dB as well as in pitch, which is important to those with hearing losses, as certain tones may be difficult to hear. The dual alarm options, jacks for two bed shakers (the only clock in the industry with this feature), a plug that allows you to plug your lamp in for a flashing light alarm, large display and a sophisticated, stylish form make this clock the perfect choice. One year warranty. Accepts 2 bed shakers (1 included). Each bed shaker operates independently. Alarm clocks with the traditional high pitched signaling alarm have worked effectively for a number people over the years; it has also been their only choice. 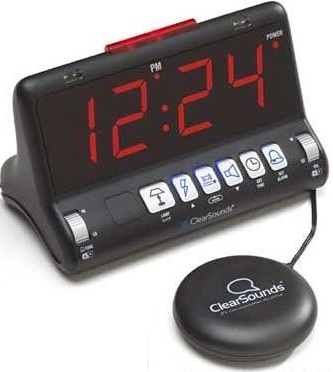 However, for those people who really need an alarm clock to wake up such people who are heavy sleepers, people with hearing loss, children and young adults, older adults and people on medication, the traditional high pitched frequencies used in alarm clocks are not very effective. The National Fire Protection Association (NFPA) became concerned that these same high pitched signals are used in smoke detectors and that there was a significant failure rate of smoke detectors at waking sleeping people. Alarm signaling studies commissioned by the U.S. Fire Administration and the Fire Protection Research Foundation, an affiliate of NFPA, demonstrated that a 520Hz square-wave signal is proven to be most effective at waking heavy sleepers – waking 92 to 96 percent of these individuals. The low-frequency signal was 63 to 69 percent more effective at waking children, heavy sleepers and people with hearing loss than current high-pitched alarms. The benefits of the 520Hz Square Ware alarm signal were so dramatic that the NFPA, in the 2010 edition of NFPA 72® National Fire Alarm Code, will require use of a low-frequency (520 Hz) square-wave signal for fire alarms installed in residential bedrooms by January 2010, and in all commercial sleeping rooms by January 2014. There are tens of millions of adults and children who have difficulty waking up using traditional high frequency alarm clocks. Add to that, there are as many as 70 million Americans having high-frequency hearing loss who would benefit from the 520 Hz Square Wave signal.